@ Apple: ThankÂ´s for clearing up the story! I'm glad Kimi's brother and nephews are spending a bit of time with him. Specially Saturday when he was sick and feeling miserable. I hope the boys are having a great time, although it must be a bit boring at times, I bet uncle Kimi makes the wait "worth it" afterwards. It shows that Kimi is their role-model... tough job. Kimi is becoming the commercial king. He is really doing quite a few of them of late. Of course I dont mind at all. 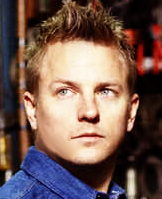 I already get to see Kimi about twice a day in the Clear adverts. 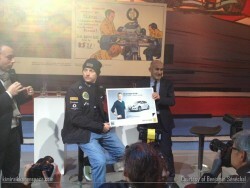 Lotus F1 Team driver Kimi Raikkonen stopped off in Paris today to launch the new Renault MÃ©gane advertising campaign. In front of a crowd gathered at the prestigious Renault Atelier on the Champs-ElysÃ©es, the 2007 world champion unveiled the campaign titled â€˜Iceman vs Fishermanâ€™. In the advert, developed by Renault and its agency Publicis Conseil, Kimi is pitted against a solitary fisherman. The campaign was shot in Spain in early January. Kimi was selected from the Renault-powered drivers for his strong identity and the qualities he demonstrates on track, which are entirely in line with the values Renault will promote with the MÃ©gane, namely dynamism, performance, rigour and quality. In a fiercely competitive market, the MÃ©gane draws on Renaultâ€™s strongest economic and ecological advances. The Energy dCi110 engine has an impressive fuel consumption rate of 3,5L/100km, allowing a record driving distance. In parallel Renault will also push the MÃ©ganeâ€™s youthful, masculine looks, sharp design and driving pleasure. Prior to his Atelier appearance, Kimi also stopped off at Renault Sport F1â€™s headquarters in Viry-ChÃ¢tillon to meet with staff building the RS27 V8 engine that will power his Lotus F1 Team chassis in this yearâ€™s FIA Formula One World Championship. I think the ad is alright. Better then the Clear one which doesn't even feature his own voice. Renault have quite a few divers to choose from so it is interesting that they chose Kimi as the face of Renault. But of course as they stated it also shows how strong he is as a brand. He has become quite his own brand and identity, moreso then the other drivers on the grid.